Topic: 78TA Member Discount Information Inside! Did you know being a member of this website can also save you some money? Fbodywarehouse is proud to sponsor this and many other F-body related clubs and websites! We not only help to provide these sites with operating capitol through sponsorships, but we also extend a discount to the members on order which exceed $100. The discount of 5% is available on both our regularly priced items but also always on our Daily Special items! To receive your discount automatically on your order is easy and simple. When you register on our website there is a drop down menu box which lists the clubs we sponsor. Simply click on the club which you are a member and finish the registration. The discount then is applied to any order you make with us 24/7/365 if that total is $100 or more. No messing around with “codes” and “coupons” do it once and it is done! As always we thank you for your continued support and appreciate your business! If we have yet to work with you for your needs we hope you will look to us for your upcoming parts needs. Remember to support ALL of the companies which in turn support this and other F-body related sites. If your current parts supplier does not sponsor this site suggest they do give back to the community they earn a living off of. 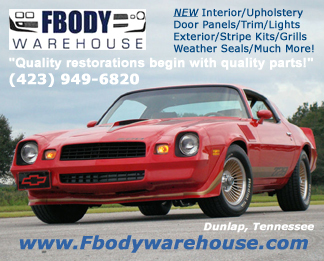 If they don’t or won’t maybe it is time to switch to a company that cares about the F-body community and not just your pocket book! Fbodywarehouse pricing ALWAYS includes SHIPPING!